“There is a time for everything . . . a time to scatter stones and a time to gather them” (Ecc. 3:1a, 5a). The American culture doesn’t care for verses like this. We’re always looking for closure, always moving ahead, gathering stones as we go and being careful not to drop one. We are taught to whine when we don’t get our way and to push a point rather than listen. It bothers us to leave any stone unturned—or uncollected. Last Saturday’s Alumni Council meeting at the Resource Center testified to what a haven the Fort Wayne campus was from this selfish mindset. Eleven Council members—10 in person, one over Skype—gathered around the table to consider how we can improve our mission to care, connect, and celebrate. These alumni sacrificed nearly half their day and several hours of sleep to join us bright and early, and they remained fully engaged throughout, tenderly gathering and scattering the stones God placed in their midst. As we helped ourselves to a continental breakfast, Michael Mortensen g91 opened the meeting with a devotional from Psalm 50:15. Then we started the day with prayer. It was touching to see these alumni—from diverse backgrounds, ages, and situations in life—humble themselves before God, unified in committing the meeting to his guidance. This set a tone of authenticity for the entire meeting. I was amazed at the ground we covered in just over five hours. The Council ran through routine reports on the archives, events, volunteers, and awards. In each category, a common theme sprang up: we need to engage more alumni. Archives Coordinator Jay Platte g69 is hoping to offer the option of off-site archive work. Additionally, he would like to get alumni involved in contributing to this blog, Fruit from the Vine, after I graduate. It could become an outlet for more alumni to share their stories, especially those who live far away. Funding tends to be a tricky issue in group discussion, but the Alumni Council was full of ideas for meeting the Resource Center’s needs. We established the importance of alumni contributing financially—even with a $5 gift—because it shows that our work is valuable to you. Alumni support is essentially our “stamp of approval.” (If you’re curious, our current need is approximately $17,000 by May 31 if we are to meet our budget.) But the Council agreed that participation, not dollar amount, is most important. Keep an eye out for our new approach to giving in the spring FW Vine, to be mailed in the next few days; the FW Falcon, to fly mid May; or coming soon here. 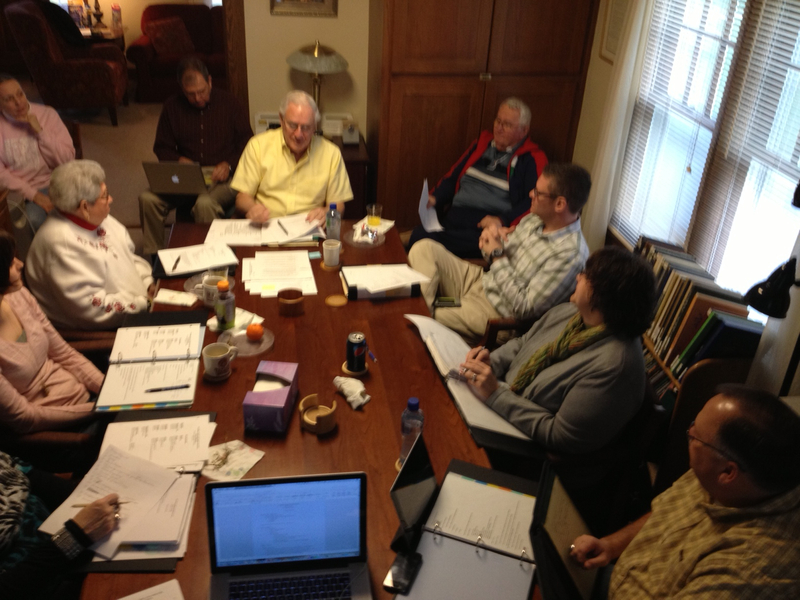 Speaking of the FW Vine, the Alumni Council approved the theme for next season’s magazine: the Pastoral Ministries program. We would like former pastoral ministries students and faculty to share how the ministry field has changed over the last few decades. We plan to revisit the concept of “full-time Christian ministry” and what that entails. Do all pastors stand behind the pulpit, or could they be cleverly disguised disciples of Christ? The morning marched on and became the afternoon. Some members had to slip away, but others stayed to carry on the conversation over lunch. We talked about the upcoming Staycation in June, about connecting with young alumni via texting, about various odds and ends that weren’t on the agenda. And at the very end, when everyone was full of food and fellowship, we discussed our identity. The Council agreed that our branding image remains elusive. How could we possibly choose one title, slogan, or metaphor that would encapsulate the entire history of the Fort Wayne campus, with its many changes through the years? 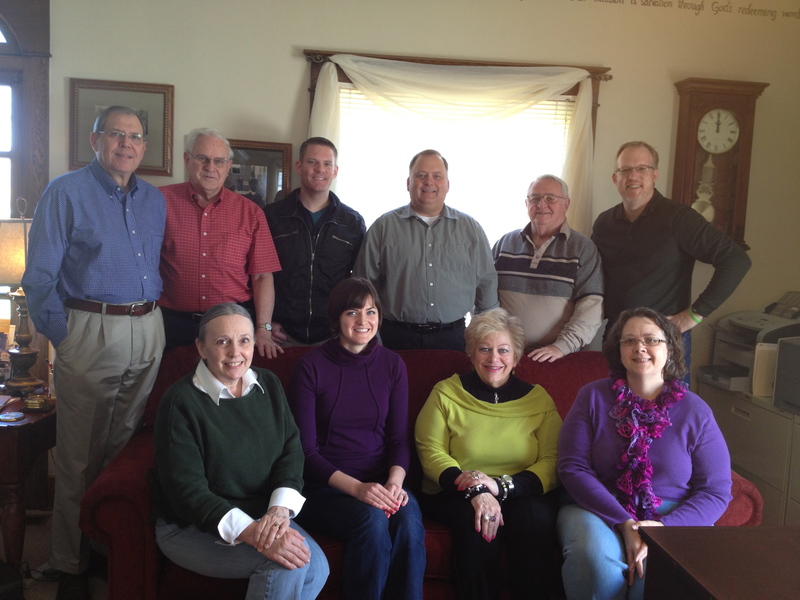 We considered emphasizing our official title, the Fort Wayne Alumni & Friends Heritage Association. We considered changing ‘heritage’ to ‘legacy,’ emphasizing the continuing nature of our ministry at the Resource Center. We considered dropping both in favor of “The Vine Community.” We even considered starting from scratch. The minutes stretched on; Council members offered suggestions and respectfully critiqued each one. Finally, Brad Ulick g88 issued a halt. “We need to commit this one to prayer,” he said. So, we ended the meeting the way it began, letting the discussion rest, to pick up again next time. The Alumni Council meeting was very much like a family dinner around a common table. Issues were brought up, admissions were made, and suggestions were offered. Some things remained unresolved, but we pushed back our chairs with a feeling of satisfaction. Because where there’s honesty and community, it’s all right to leave loose ends. Like scattering and gathering stones, the Alumni Council recognize that it’s important to hold tightly to the works God calls us to—and to let go of everything else. So they gathered close to one another for a few hours, engaging in that remarkable love and unity unique to the Fort Wayne campus. Are there unresolved issues you would like the Alumni Council to discuss? What “stones” has God called you to gather, and what “stones” has he called you to scatter? This entry was posted in FWFARC Stories. Bookmark the permalink.